"This helpful manual has introduced me and my staff to options that will satisfy golfers' expectations while reducing environmental impact. 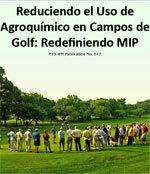 It is an insightful, helpful and readable resource for golf course superintendents and staff no matter their level of experience or education. 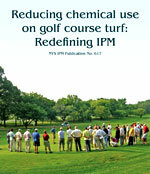 The manual is especially valuable for introducing new employees to golf turf maintenance." Your guide to reducing environmental impact and saving money. There is growing public concern over the use of pesticides and fertilizer on golf courses. At the same time, there is increased demand from the golfing public for immaculate course conditions. This manual will help you resolve that conflict by helping you adopt cultural practices and pest management systems that are less reliant on pesticides and fertilizers. Based on a long-term field research project the Bethpage State Park Green Course, the manual combines new research findings as well as superintendents' experiences to help you develop your own management program to meet the twin goals of healthy turf and environmental sustainability. Please specify which version(s) you would like. 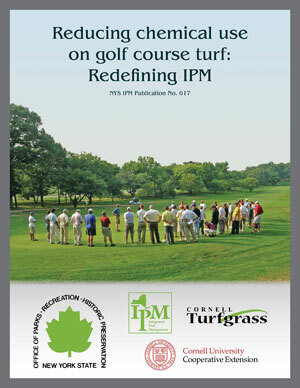 The Bethpage study was initially funded by the United States Golf Association (USGA), subsequently by the Northeastern IPM Center (USDA-CSREES), and currently by the NYS Office of Parks, Recreation and Historic Preservation (OPRHP). OPRHP and Bethpage State Park in particular have been extremely supportive of this project, and have contributed immeasurable in-kind services. In addition to these organizations, the Golf Course Superintendents Association of America (GCSAA) and their Environmental Institute for Golf (EIFG) dedicate resources to funding scientific research and providing education on best management practices for golf. Amongst all these groups promoting environmental stewardship, New York State's commitment to reducing pesticide use on 29 state operated golf courses may represent the largest environmental leadership initiative in the industry, and paves the way for improving the environmental compatibility of golf.